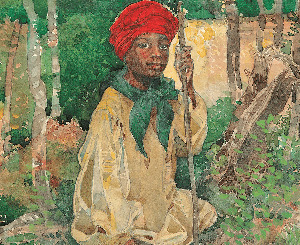 Spend the morning diving into illustrator Jerry Pinkney's books about Harriet Tubman and John Henry, and make a book about your own courageous dreams. This program is part of a national celebration of the 50th anniversary of the Coretta Scott King Book Awards, and also ties into the current exhibition at the Woodmere Art Museum. The program runs from 10:00 to 11:30 a.m. in the children's department, and is designed for families. This program is also supported by the Rosenbach Museum.